With spring near, you’re hoping for a cure to cabin fever. Maybe a camping trip to your favorite spot is in order. Time to refresh your camp craft skills and awe your camping buddies with your rope and stick tying skills! Lashing isn’t just for Boy Scouts and pirates. This skill comes in handy for gardeners, homesteaders, bushcrafters, and for that unlikely event when you need to build a raft to escape a cannibal infested island. Square lashing is used when securing spars (poles) that cross between 45º to 90º angles. It’s a super strong lashing still used in many parts of the world to build bamboo scaffolding. You probably won’t have the need for a 5 story construction platform, but you may want to build a few camp comforts like a table or wash station. These are commonly used terms when describing the art of lashing stuff together. 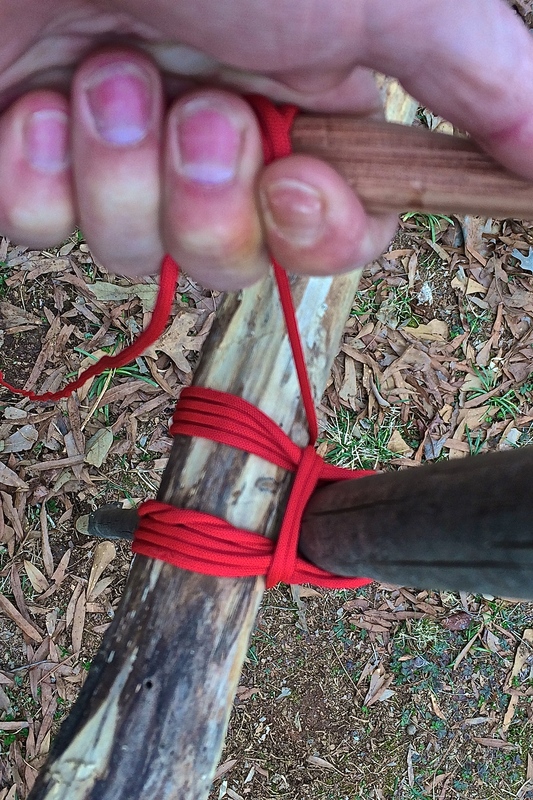 Wrap: A series of turns of cordage around two or more spars (poles) you’re binding together. Frap: Turns of cordage on top and perpendicular to the previous wraps. Fraps go between the spars to pull the joint tight. Spars: Poles to be lashed together. Tag End: The short end of your cordage when tying knots and lashings. AKA ~ running end. Working End: The long end of your cordage when tying knots and lashings. AKA ~ standing end. Tongue Lashing: What you’ll receive from camping buddies if your lazy lashings on camp furniture fail. Take your time, use good materials, and tie it right. Natural fiber rope/twine – whipping should be applied to the ends to prevent unraveling. 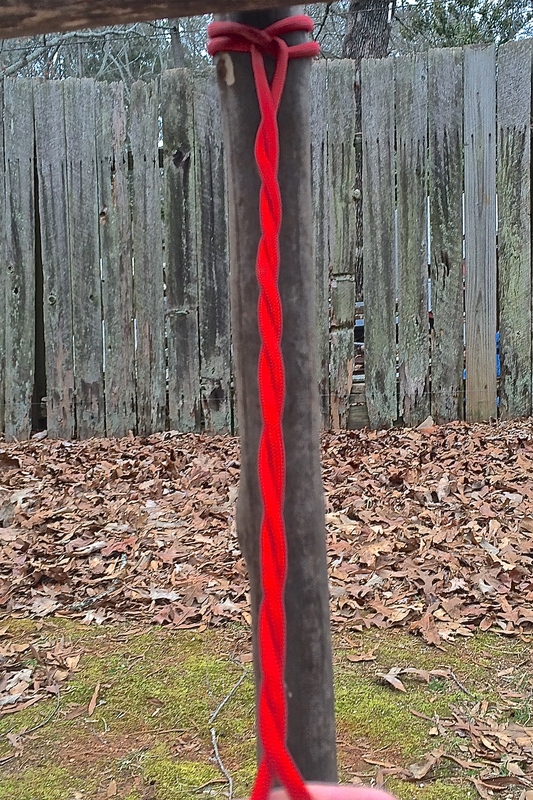 Paracord – I use red paracord in this demonstration as a visual aide. Melt the ends to stop fraying. It is my least favorite cordage for lashing. Spars: Two wrist-size sticks; one vertical, one horizontal. Cutting Tool: Scissors work… but not the most manly cutting tool at camp. For practice, consider building a lashing station in the backyard. Set two posts in the ground. Lash a cross spar between the two posts about waist height. Stand another spar against the horizontal cross spar to practice on. As a math teacher, here’s a simple equation to prevent cutting cordage too short or too long. Y represents the total length of cordage needed. X is the variable representing the combined diameter of the two spars being lashed together. The number in front of the X, also called the coefficient (you didn’t really want to know that), represents 3 feet. Let’s say the combined diameter of the two spars is 5 inches. Plug in 5 for x and multiply by 3 feet. You’ll need 15 feet of cordage. 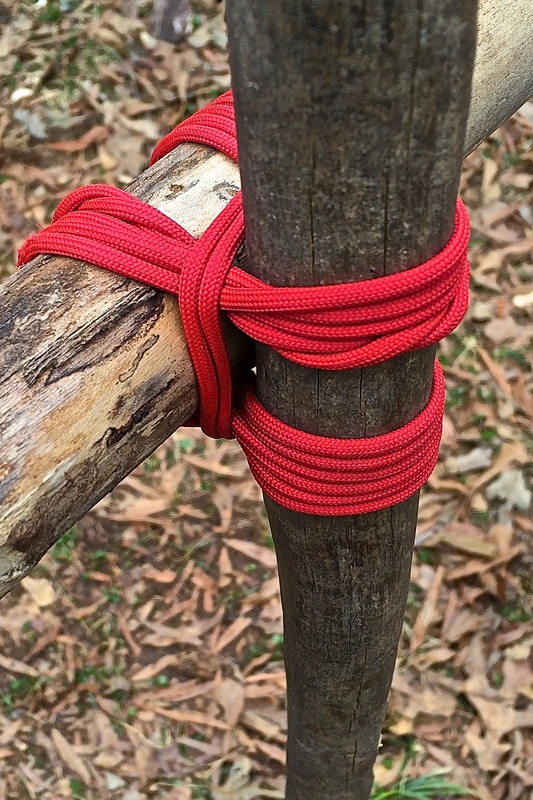 Take one end of your cordage and secure it to the vertical spar using either a clove hitch or timber hitch. The starting knot will be beneath the horizontal cross spar. 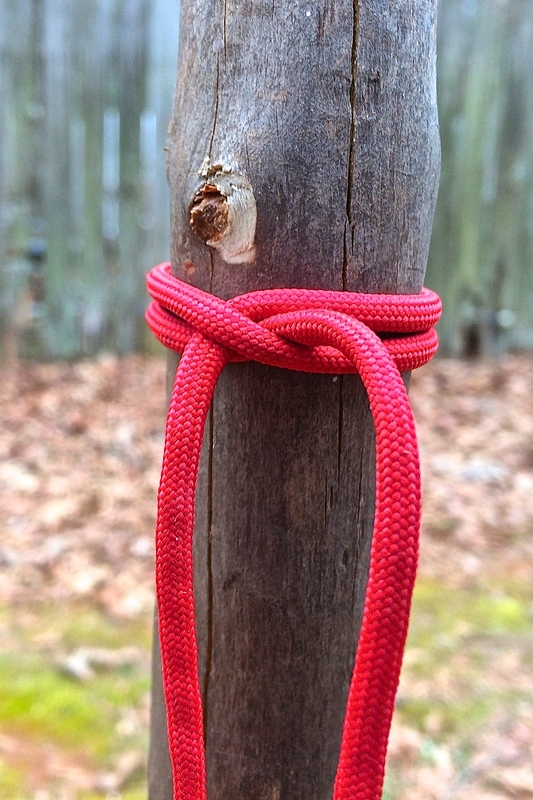 These two knots are easy to tie and untie without resorting to cutting with those cool camp scissors. A clove hitch is basically two half hitches put together. 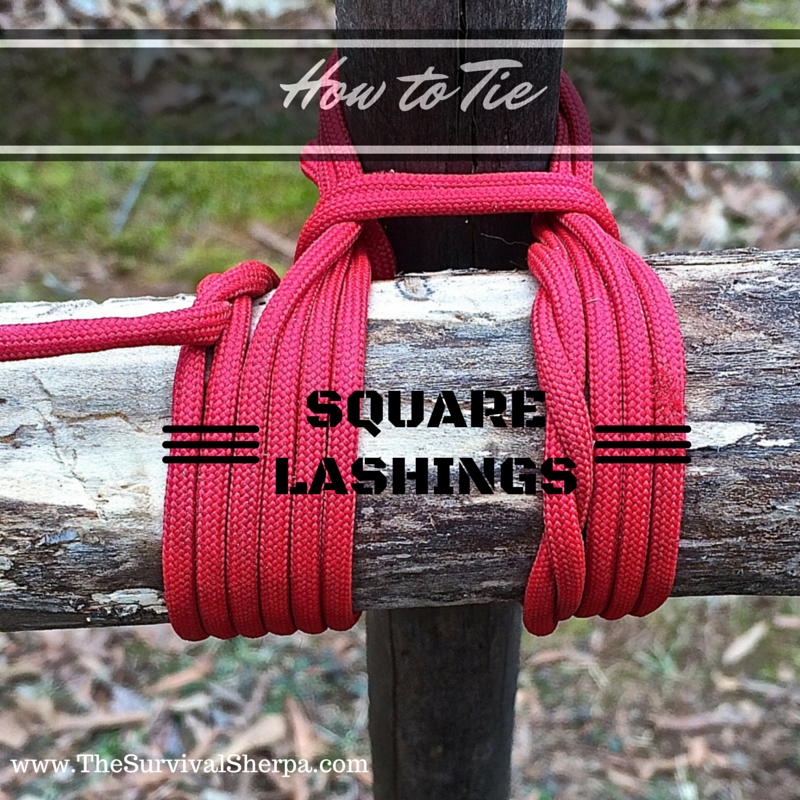 I prefer to start lashings with a timber hitch (my video below shows how to tie a quick one). 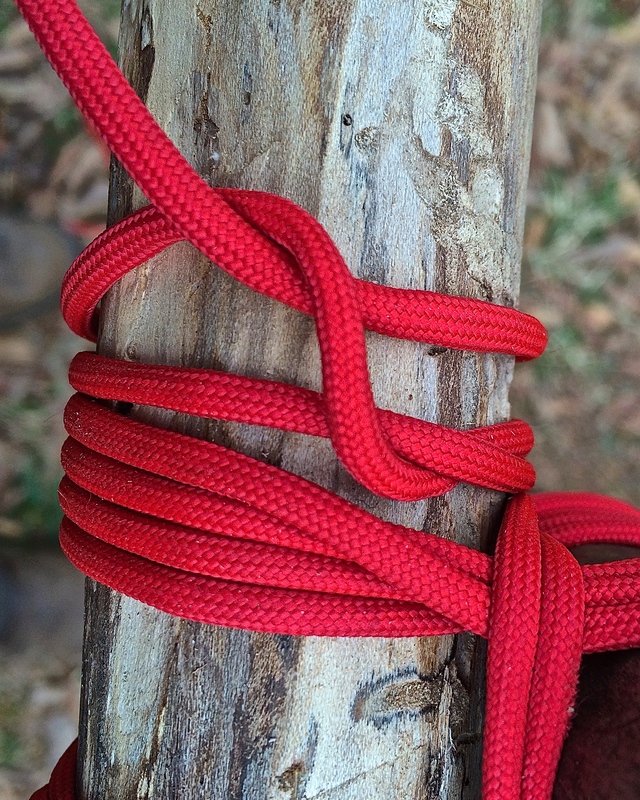 For this blog post, I used a clove hitch with the red paracord. If you choose a clove hitch, leave a long tag end (3 to 6 inches) that will be twisted around the working end of the cordage as an added security measure on the knot. With the tag end twisted around the working end of your cordage, (a) wrap it up and over the horizontal spar, (b) around the backside of the vertical spar, (c) back over the opposite side of the horizontal spar, (d) and back around the vertical spar where the clove hitch is secured. This completes your first wrapping. The wraps should cross the spars at a 90º angle… this angle gives the Square Lashing its name. This is the pattern for the wraps. Note: The working end of the cordage is in my left hand… only because my camera is in my right hand. Continue this wrapping pattern until you have 3 or 4 complete wraps. I don’t count the first twisted wrap. It’s important that you keep the wraps as tight and parallel to one another as possible during the process. This not only aids the appearance of your lashing but also functions to make the joint stronger with less friction on the cordage. Note: Keeping slick paracord tight can be a challenge. Wrap a toggle stick in the working end of your rope to help pull the wraps and fraps tight. Take the working end of the cordage between the spars and over the previous wraps to create one frapping. Apply at least two fraps between the spars. Cinch the frapping tight with a toggle. Tarred bank line bites and holds on itself very well. That’s one reason it’s my goto cordage. With the wraps and fraps tight, you’re ready to terminate the lashing. Tie a clove hitch on the horizontal cross spar next to the wrapping. 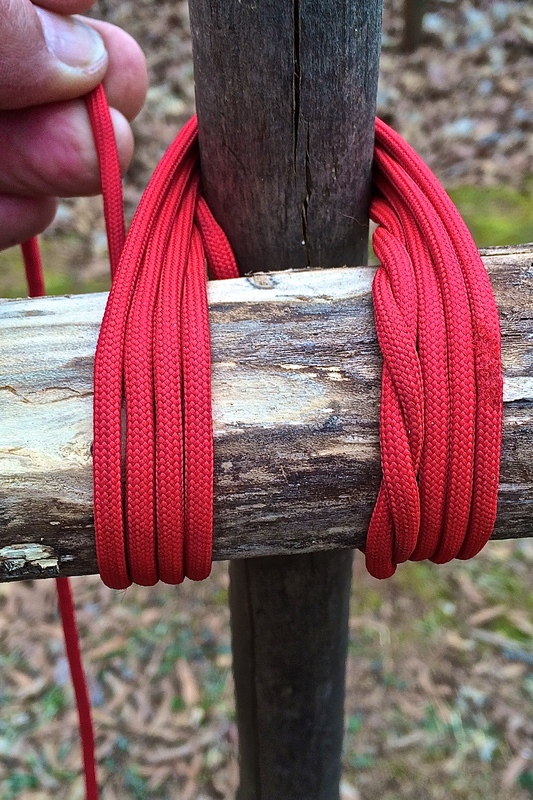 An easy shortcut is to tie two half hitches to form a clove hitch. This makes terminating slippery cordage much easier. Just be sure to wiggle and tighten each half hitch. 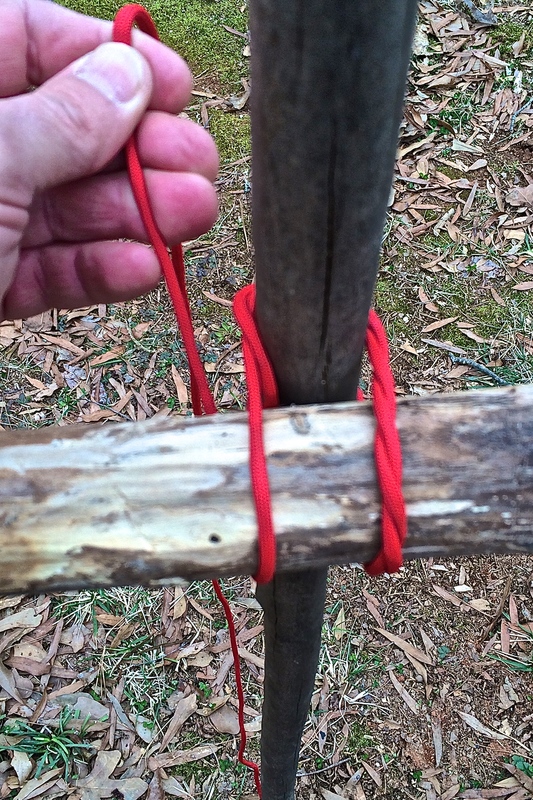 For added security, tie a third half hitch beside the clove hitch. Sometimes it’s easier to just watch a video on lashing. 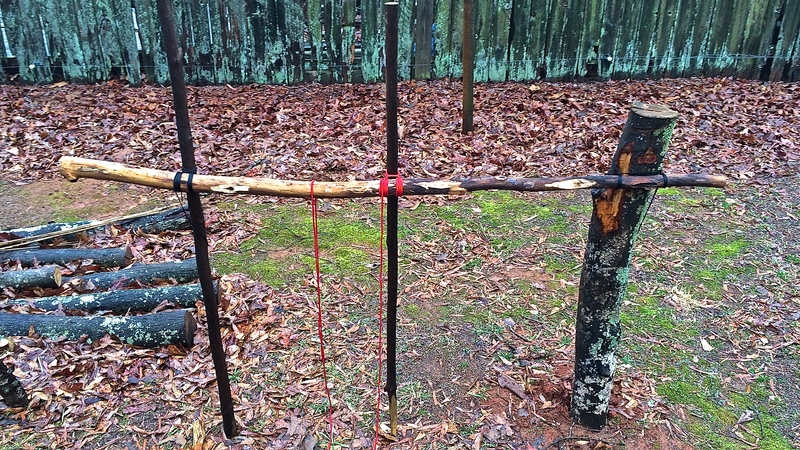 Here’s a square lashing video using tarred bank line while building a camp table. I’m sure you’ve tied your fair share of spars, Todd. Keep Doing the Stuff, my friend! Great read- just one suggestion for your cordage equation: keep your units consistent. When you said “for a combined diameter of 5 inches” I immediately assumed I would need 15 inches of cord due to consistent units. That didn’t seem like enough, but then you mentioned “times three feet.” I realize most people don’t want to multiply 36 by 5, but it would make things more clear to us engineers out there. Thanks. Thanks, Brice. Guess a clearer mention of the unit of measurement might of helped. Thanks for the comment! Thanks for a great post! 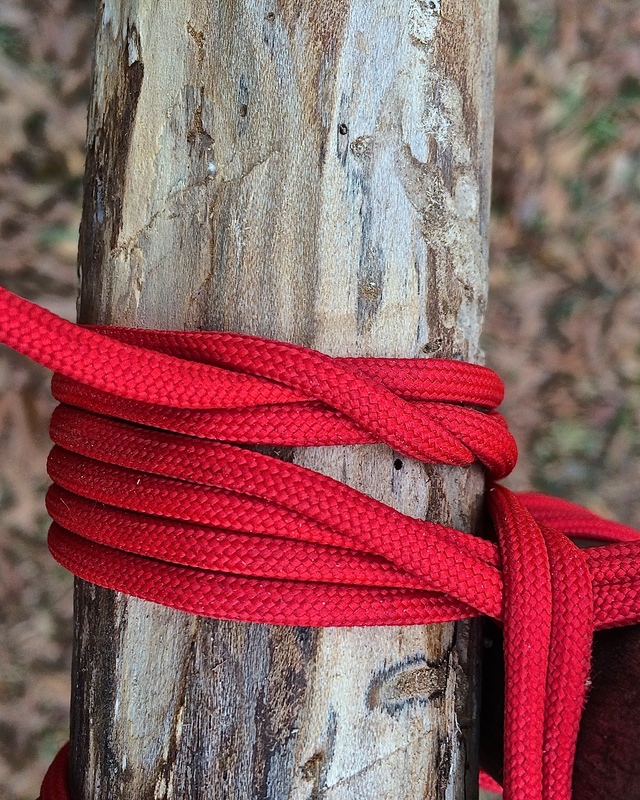 I like your timber hitch tip to begin rather than the clove hitch I was using and agree about using bank line. It seems to me like paracord is too flexible and stretches after use and when I used jute it just didn’t seem to have any strength to hold up to heavy use.